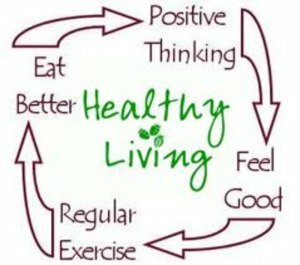 Being healthy should be part of your overall lifestyle . Living a healthy lifestyle can help prevent chronic diseases and long - term illnesses . Feeling good about yourself and taking care of your health are important for your self - esteem and self - image. Maintain a healthy lifestyle by doing what is right for your body. When the body lack in some key nutrients such as vitamin A, B, C and E, and zinc, iron and selenium - can weaken parts of your immune system. healthy diet rich in fruits, vegetables, whole grains and low-fat dairy can help to reduce your risk of heart disease by maintaining blood pressure and cholesterol levels. *Drink alot of water-water is very vital for maintaining a good health. The natural liquid offers the benefits of hydration, nourishment, and improved well-being. Water can cleanse toxins from the body, improve brain function, energize muscles, control weight gain, and balance body temperature and fluids. It’s recommended to drink about 8 glasses, or 64 ounces, of water per day. *Exercise-Exercise is a great way to stimulate your health, physical activity helps improve longevity and overall health. Try to exercise daily or up to three times a week .exercise help to burn out excess fat in the body and also helps to regulate free flow of blood through the body system.engage your self in some physical activities like running,skipping,hiking,pull ups,jugging and even walking,faillour to exercise can cause serious damage to the body system. *Take good rest-It is vital to get 7 to 9 hours of sleep for people aged 26 to 64 years. Sleep is tantamount to rest as it is its ultimate form. It plays a vital role in promoting overall health physically, mentally and even emotionally. taking enough hours of sleep allows your body to support and promote healthy brain functions as well,taking enough sleep also helps the body to repair and heal itself. *Abstain your self from harmful substances-The intake of harmful substances can cause alot of damage to your the kidney ,heart and liver.